Here is a maxim that needs to be understood when you become involved with weightlifting: the legs are the true foundation of the body. By weightlifting what would be meant are ALL forms of weightlifting. Whether you are interested in bodybuilding, power lifting, or merely getting in shape, you need to develop the muscles of the legs. Lifting weights without paying proper attention to the legs is akin to building a house of a weak foundation. This is just not the way to go about things. As such, effective care and attention must be paid towards properly and effectively developing the leg muscles. There are many different ways to work the legs. Similarly, there are many different pieces of equipment that can be employed to exercise the legs. 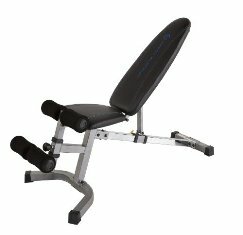 One such device that is common with professional and home gyms would be the adjustable leg bench. This device is certainly not a new one as it has been around for many decades. The value of the device is a true testament to its staying power in health circles. Of course, owning or maintaining access to an adjustable leg bench is not enough. You will also need to employ effectively for working out. Here is a brief overview of a sample leg workout you can employ with such a bench apparatus. The two most common exercises that can be performed on an adjustable leg bench would be leg extensions and a reverse leg curl. These exercises could be combined with other leg exercises in order to provide a total leg workout that both tones the muscles and helps build them. The leg extensions and the lying leg curls can be made more challenging by performing them with one leg. You also have the option of performing the squats and the calf raises with a barbell or on a machine. This exercise routine is intended to be performed one or two days a week. Anything more than that could potentially lead to overtraining. You are well advised to avoid overtraining and, instead, provide your body with the much-needed rest it will require to repair and build its muscle fibers. This will lead to the ripped and muscular look in the legs more than anything else. Well, a lot of effort in your workout sessions will also contribute to such an outcome. Conversely, you do not want to skip this workout for more than a week since you do not want to see your progress regress due to lack of activity. 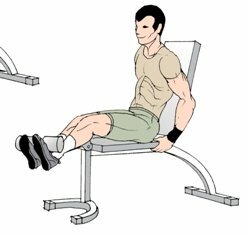 An adjustable leg bench is an excellent workout apparatus that does not always get its proper due. That is a shame because it can definitely help improve the development of your upper quads tremendously. As such, integrating this device into your leg workouts is highly recommended.